I had absolutely no knowledge of chorography and chorographers until a year or so ago (and my spellcheck seems to still be ignorant of them), when I spotted the former term in the abstract of ‘Beowulf off the map’, a 2009 article by Alfred Hiatt I regret to say I never got around to reading properly before now (online abstract here). What was/is chorography? Perhaps the earliest definition was that provided by no less a figure than Ptolemy of Alexandria, who characterised chōrographia as the practice of setting out “the individual localities…registering practically everything down to the least thing therein” in contrast to the “broader, general outlines” of geōgraphia (yep, geography) (Hiatt 2009, 18). In much the same way as the concept of chorography spurred Hiatt to argue for its applicability to the non-cartographic analysis and presentation of the spatial aspects of Beowulf poem, so it got me thinking about how relevant it might be to my own work – especially in light of this blog’s eponymous county-level focus – and more generally to fields like landscape archaeology and place-name studies in the twenty-first century. 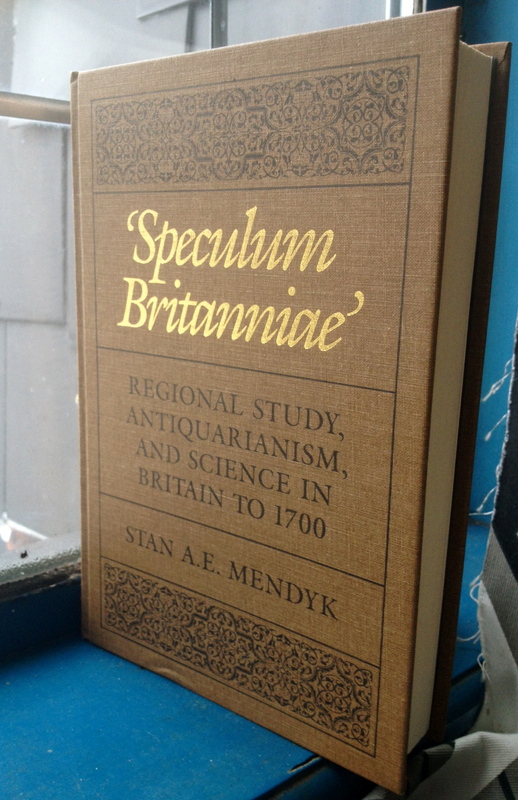 I let this initial excitement subside and slip to the back of my mind until the other day when, on a complete whim, I bought Stan Mendyk’s excellent ‘Speculum Britanniae‘: Regional Study, Antiquarianism, and Science in Britain to 1700. (It is to be further commended for be such a handsome tome – just look at it there above! As it happens, my next big post will be on my personal bugbear of the too-often abysmal design quality of the covers of medieval-themed books.) Early on in the book, chorography is invoked via the characterisation of the chorographer as a “local historian-antiquary” (Mendyk 1989, x). In the first chapter, Mendyk (1989 21-22) reproduces the definitions penned by the fascinating John Dee (“Chorographie seemeth to be an underling, and a twig, of Geographie”) and Arthur Hopton (whose synonymising of chorography with topography prefigures the widespread use of the latter term in antiquarian publications, for instance the early nineteenth-century Antiquarian and Topographical Cabinet series). Later chapters of Mendyk’s book focus on the personages formative to the development of antiquarianism in England, as well as their key works, including John Norden, William Dugdale, Robert Plot and John Aubrey, whose 1673 Perambulation of Surrey is the subject of pages 175-77. I have used Aubrey’s volumes on Surrey (which were reprinted back in the 1970s), along with similar works by the likes of William Camden, Manning and Bray, and Edward Brayley, many times in my research on Puttenham and elsewhere in the county. One peer of the aforementioned who I was aware of but had never seen his chorographical opus on the county was Nathaneal Salmon. 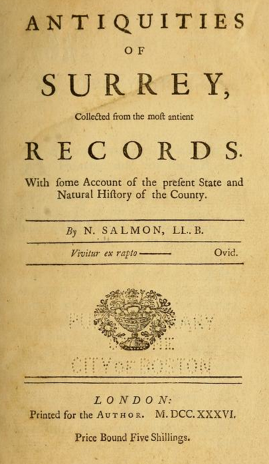 His Antiquities of Surrey was printed in 1736 but, as far as I’m aware, it was never republished and as such is encountered far less frequently in archaeological and historical studies than the above-mentioned. Should you have at least £165 burning a hole in your pocket so soon after Christmas, you could buy an original copy of Salmon’s work (compare that with the “Price Bound Five Shillings” of the book back in 1736). However, if like me you do not fall into that boat, salvation is at hand since the entire book is available to read online (and download should you wish) from Internet Archive. I went through Salmon’s book yesterday and found it to be an interesting, if slightly patchy work. Some places, or rather some particular aspects of places, are discussed at length, whereas accounts of others are little more than a paraphrasing of the relevant Domesday entry. Puttenham (pages 132-33) is more or less in the middle; a curious silence on the Hillbury earthworks but unique speculation over Puttenham’s absence from Domesday Book and its relationship to Wanborough. All in all, Antiquities of Surrey was very much of its time. The interpretations of place-names are – with one or two notable exceptions – woefully inaccurate, whereas the references to certain mineral springs contain detailed, proto-scientific observations upon the waters’ healing properties. And what of chorography? Much like Hiatt, I see little merit in (nor prospect of) it being revived as an intellectual discipline. That is not to say the term does not still have merit, especially as a substitute for the overworked and over-prefixed geography and topography. With there being the faintest murmurings of a reawakening in interest in historical geography as a means of spatial analysis and evaluation, so it could be that, after Ptolemy of Alexandria and the likes of John Dee, chorography will soon be making a third appearance in spatial discourse.